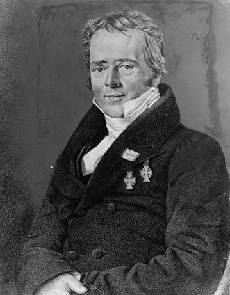 Hans Christian Oersted was born in Rudkobing on August 14, 1777. He was a Danish philosopher and physicist who made contributions to the scientific community including the isolation of aluminum, he is best known for his discovery that linked electricity and magnetism. Ørsted established in 1820 that an electrical current coursing through a wire creates a magnetic field that can deflect a compass needle. This was the first demonstration of the interdependence between electricity and magnetism. The experiment, which became a classic, was based on philosophical principles, as Oersted believed that all forces were interconnected. At the time of discovery, Ørsted did not suggest any satisfactory explanation of the phenomenon, nor did he try to represent the phenomenon in a mathematical framework. However, three months later he began more intensive investigations. Soon thereafter he published his findings, proving that an electric current produces a magnetic field as it flows through a wire. His observation stimulated further work on electromagnetic phenomena by numerous investigators, including André Ampère and Michael Faraday, leading to a grand synthesis in 1873 by English physicist James Clerk Maxwell. In his honor, Oersted is the unit of magnetic field strength in CGS electromagnetic units. It is defined as the field at the center of a single-turn circular coil of radius 1 cm and carrying a current of 1/(2π) abamperes. Oersted also worked on thermoelectricity, was the first to prepare metallic aluminum, studied the compressibility of liquids (with an instrument of his invention called a piezometer) and gases, and conducted research on various chemical topics. Hans Christian Oersted, is a man ahead of his time. A pioneer and a building block in the history of electrical engineering. A legend and a true Electrical Engineering Hero.